New features are available for OneCalendar. If you already have it installed either as standalone or as part of Onetastic, you don't need to do anything. It will update itself when you run it next time. This will be the first test of the built-in upgrade mechanism so let me know if things don't work as expected. As to the new features, there are plenty, some small some big. Ideas for them came from people who use it, so it is important for you to give feedback as that is the primary driver for any update. I also updated the OneCalendar page with the new features so if you want to see old and new features together as a whole, you can do so there. This was available on the main screen before, now is under settings here. You can also use the shortcut for it on the main window, more on this below. : You can choose which notebooks are to be displayed in OneCalendar. If you want to see all your notebooks, just click on All Notebooks. If you want to pick and choose, then click on Selected Notebooks and then choose the notebooks below. : Some people like the way OneCalendar displays the pages on both created date and last modified date. I am one of them. However some others told me that they want it only on created date, and some others only on last modified date. This is easy to provide, so I put an option to choose whether you want them in created date or last modified date or both. : OneCalendar will create a new window every time you start it. If you are using OneCalendar from Onetastic, then this might create several windows. If you want OneCalendar to use the same window every time, then you can specify it here. You can leave the Settings screen by using the back button at the top or the Escape or Backspace buttons. On the month and week view, you can click on a day number to quickly switch to day view and navigate to that day. Previously you would have to switch to day view and then find the day with previous/next buttons as it would switch to some seemingly random day in the month. You can now use keyboard shortcuts to change font size (Ctrl+- and Ctrl++), view (Month: Ctrl+1, Week: Ctrl+2, Day: Ctrl+3) and navigation (Ctrl+Left Arrow and Ctrl+Right Arrow). See more below. When you are viewing a month, week or day that is not the current month, week or day, you can click on the little button on the bottom left to quickly get back to the current month, week or day. You can also use Ctrl+0 shortcut for this. Enjoy all the new features and let me know about any issues or other comments below. The highlight colors in OneCalendar are not added, but can be extracted from corresponding sections I guess. I like the month view so that i can have an overview of all my projects. i guess if different colors can be added matching the section colors would be much better, so it's easier to see which ones are from which section. Didn't found any description why some entries in calendar view are written in bold letters. gilligan: This usually happens when you install the wrong version (32 vs 64 bit). Please check the bitness of your Office installation. If you are sure you installed the correct version I can follow up via e-mail to get your logs and take a look. I recently added OneCalendar & OneTastic to my work laptop after finding it much useful on my Surface...one problem - after a couple installs - the OneCalendar icon in my OneNote Ribbon Home>Tools>Launch OneCalendar does not work. Any suggestions? Have tried removing from Ribbon and adding back in - and then restarting OneNote. 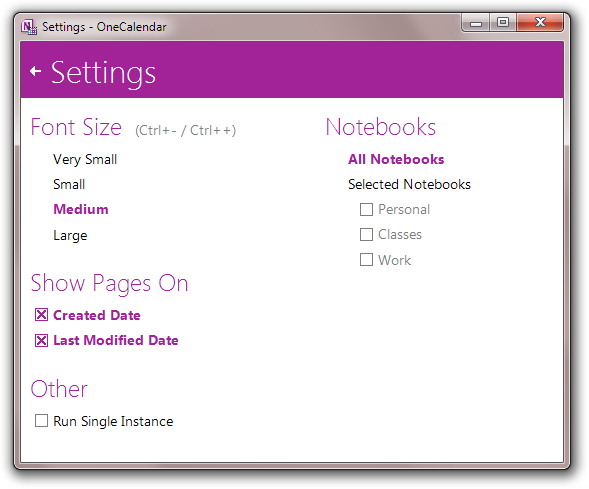 Onetastic and OneCalendar requires OneNote 2010 or above. I got 64 bit OS and I\'m using 2007 One-Note. After installation, One-Calendar didn\'t show up on my ribbon. I read the FAQ section, and took care of everything, but still have the problem. \"Failed to load pages: Class not registered.\"
Thanks for all this work you do on OneNote, Omer. I really do appreciate it and I know lots of other people do too. This last update where you can select text from an image has been something Iâ€™ve wanted for years now and you finally were the one to do it! Thanks again. When I hear someone from the OneNote team make a reference to keeping OneNote \"easy\", I think they mean \"easy for them to program\", not necessarily easy for people to use. I get so frustrated many times with OneNote because it\'s so hard to do what I think should be a very simple thing to do. I\'ve sent a few of those to you in the past. The one I\'m really upset about is copy information from web pages. When I look at other products like Evernote, I wonder why I have to spend so much time in OneNote to get the same results. For instance, Evernote will automatically select the \"article\" for you and has a smart filing feature built-in. Then when it makes the copy, it\'s a true HTML representation of the original, not a picture or an ugly jumbled text version full of formatting garbage. It maintains the fidelity of the copied information and even has a simple, but good editor to handle the HTML if you so desire. This is where I think the MS OneNote team and management get confused by \"easy\". To do that kind of rendering I\'m sure takes a fair amount of programming and probably even more discussion and planning to get it done. Yet I and all the end users end up spending countless hours \"cleaning-up\" and reformatting the information so it\'s legible and usable. By the way, I donâ€™t believe in Microsoftâ€™s usability process (or even their surveys.) After 30+ years of using Microsoft products and being in the IT sector myself, I canâ€™t believe that they base many of their usability decisions on actual user input. I gave up making suggestions many years ago when I saw that version after version of Office, IE, Windows, Windows Servers, etc. still had the same bugs and usability complaints that the previous versions had. And yet they had a lot of new features and Wow stuff! Anyway, thanks again for your efforts â€“ we do appreciate it. Ron, you can change the date of a page in OneNote. After you create the page, click on the date control below the title to change the date. I just found OneCalendar. Looks like something I\'d like to use, but it appears I have misunderstood it. I was hoping to use it as a calendar since I don\'t have Outlook. I can\'t create entries other than today. Is that correct? Arno, thanks for the feedback. I forwarded it to the team. For bookmarks, did you try the latest \"Pin to Desktop\" feature of Onetastic? Does that solve your problem or did you have something different in mind. I think customizable styles can be added by an add-in. I can look into this. Bookmarks: So often I\'m working on a project and need to jump around from notebook to notebook, section tosection, page to page. But they\'re usually the same links I have to go to. Although favorites could work for this, the bookmarks wouldn\'t be really favorites, they were needed only for that particular project. Bookmarks would be much more efficient for this. I use something similar in the small notebook I carry around. I use those postit bookmarking tabs. Search MRU (Most recently Used) - The search drives me nuts because those no MRU list. Even the search in Windows 7 doesn\'t have one. That\'s one of the most useful features that was removed. Why did they do that? We need it back. Styles - Either a way to add our own styles or a way to change the ones built in - even if it\'s just the font, font size, bold, italic, and underlined. Know where you are - so often I\'ll jump to a page I found via search and I\'ll have no idea where it is located. The notebooks don\'t change to match my location. The visual cues are also so faint that through my thousands of pages, it\'s a real time-consuming chore to find where I am. Something needs to be done in this area. Some ideas I\'ve had are: 1) Have the notebooks (with their sections and pages) open up to where you are. This needs to be user definable so it can be turned on or off. 2) Do the same as #1 but don\'t automatically open to that location, just move the notebook into visual view. 3) Use a breadcrumb approach to show the location. One of the best implementations of the breadcrumb I\'ve seen is in a program called Directory Opus. Just google it and you\'ll find it. 4) Boost the visual cues so that they\'re more obvious. One thing that OneNote needs to be better at in general is navigating through it much faster. The current navigation scheme is designed for a few notebooks, sections, and pages not the hundreds and even thousands that I believe many of us are doing. Well, that\'s all for now. This is long enough. If you want to contact me use this email: <e-mail address hidden to prevent spam>. Thanks for listening! dimansyah, I can reproduce the problem. I will get it fixed on the next update, for now please either use the standalone version or uncheck the Run Single Instance as you figured out. Thanks for reporting this. For the standalone onecalendar, though the option \"Run Single Instance\" is checked, there is no problem. But once I run it from OneNote Ribbon (not standalone), the problem appears. To stop it, I activate the standalone onecalendar and uncheck the option \"Run Single Instance\". I see a problem. Is it because the option \"Run Single Instance\" is checked ?? Thanks. The multiple selection tip is helpful. PS It would be cool if the cropping tool could work for printouts, too! Also if you want to rotate multiple pages, you can select them all by ctrl click and rotate them together. This will take approximately the same amount of time to rotate a single image. About 10 pages is really slow. I can play a little more and see if there is anything I can do to make it faster. I am aware of the second issue you mention and will be fixing it on a later update. It is because OneNote keeps two images for a printout, one is raster and the other is vector based. It will first display the raster based one and then quickly switch the vector based one for a sharper image. Onetastic currently only rotates the vector based image, that is why you can sometimes see the non-rotated image. This also shows up elsewhere: If your notebook is on Skydrive or Sharepoint, and if you go to the OneNote web application, you will see the images in the non-rotated orientation, as the web application only displays the raster image. Fix to the issue will end up fixing this as well. Omer, Thanks for the quick response. To provide more detail, this is a 12 page scan from a document (I don\'t know if 12 pages is considered a lot of printout pages). I wanted to rotate a few of the pages because there are tables on them that are printed at 90 degrees to the rest of the document. I have encountered another strange behavior. When I scroll through the document with the scroll bar, the pages appear in their previous, non-rotated orientation. When I release the scroll bar, they appear rotated. Andrew, this would happen if there are a lot of printout pages or other images on the page. Onetastic has to read all the page content, find the image you want to rotate, rotate it, and then write back the whole page content. You can copy the printout image to a new page and rotate there and copy back, this should be much faster. If you need to rotate several printout images then it might be easier to delete them and re-print them with landscape option from the print dialog. I have a problem that it seems to take a reaaaaally long time (about 2 minutes) to rotate a printed page in OneNote 2010 during which time OneNote is completely hung (scroll bars etc. don\'t work). I am using 64-bit version of OneNote on Windows 7 64-bit. Update worked perfectly, new functionality is excellent! Keep up the great work, this tool is invaluable to someone like myself who literally has 12 years of notes in OneNote, across ten notebooks, sync\'d to about six devices!